JG talks about coping with regret with guest Dr. Andrea Gould-Marks and Executive Producer Kenya Gipson filling in for Deidre. Dr. Andrea Gould-Marks our “Senior Psychological Advisor” (according to JG) was back this week to discuss the feeling of regret and how to live your life with purpose. For more information on Dr. Andrea and her work visit www.lucidlearning.com or listen to her Podcast, Boom Goddess Radio. Dr. Andrea helped JG to answer some questions he had on regret and how to cope with it. Here are just a few of Dr. Andrea’s wiZdoms and you can hear the rest by listening to our latest episode! What is regret? Regret is that inner voice of disappointment with ourselves that reminds us of a poor choice we have made, a decision that was not thought through, not being true to ourselves, or a missed opportunity. When do we feel regret? People feel regret during times of change or life milestones. We can hear our inner voice louder during more reflective times, or when we are not busy concentrating on something else. Is regret different from remorse? Regret is to feel sad, repentant, or disappointed over something, while remorse is more emotional. You may feel more guilt-ridden, shameful, or embarrassed when you’re feeling remorse. Do men and women feel regret differently? Men usually do a better job of compartmentalizing their emotions or burying them until they come back up. Women on the other hand are more conversational and share their truths and feeling more openly, so their regrets might be more exposed. However, once regret has surfaced, there is not much of a difference in how it is experienced. How do people live without regret? Let regret serve as a reminder to be true to ourselves and accept regret as a by-product of growing up. 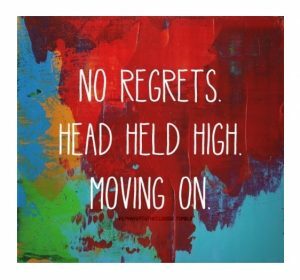 Allowing our regrets to surface and removing the suppression helps to “get it out” and then we can work on moving forward. What are some regrets you have that you want to let go of? Let us know by leaving us a voicemail at 1-646-653-9278 or sending us a message here.